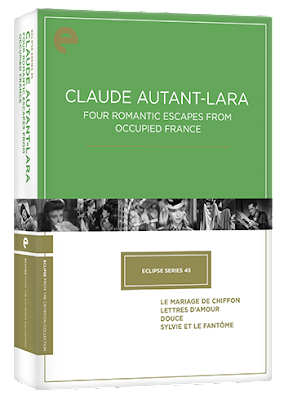 During the Nazi Occupation, French director Claude Autant-Lara reeled off a series of box-office hits that struck a chord with audiences eager for a romantic escape from desperate times. He extended his commercial success through the post-war years, but then suddenly found himself under attack from an unexpected source. Francois Truffaut's now-famous 1954 critique of “A Certain Tendency” in French cinema primarily targeted screenwriters Jean Aurenche and Pierre Bost for their staid literary adaptations, but since they wrote many of Autant-Lara's most successful films (including all the films in this set) the director took heavy collateral damage and increasingly found his work marginalized as an exemplar of the dreaded “tradition of quality.” This new four-film box set from Eclipse suggests that the scorn was mostly unwarranted, and that a concerted critical effort at latter-day redemption is equally unnecessary. “Le Mariage de Chiffon” (1942) is typical of most of the set. Pleasant, efficient, and almost instantly forgettable, it features Odette Joyeux, the stand-out star of the set, as a sheltered 16-year-old from an aristocratic family who is pursued by a much older military officer (Andre Luguet). Chiffon, however, has her heart set on another much older man who also happens to be her uncle (Jacques Dumesnil). OK, he's actually the brother of her step-father but still... I guess the times were just different as this story was apparently considered charming. Joyeux was nearly thirty at the time and hardly makes a pretense at actually playing an innocent teen, blunting some of the gross-out factor. The plot is largely forgettable (did I already use that word? ), but the film evokes some of the romance of the earl days of aviation as good old Uncle Marc risks everything to be first in flight. The faithful house servant Jean is also brought to life quite gamely by Pierre Larquey. A graceful, unobtrusive camera glides through many scenes, underscoring the delicate, audience-pleasing romance of... an underage girl finally hooking up with her uncle. Anyway, it's just fine, but I can't say the same thing for “Lettres D'Amour” (1942) where the light, romantic touch tilts into vapidity. Less than a year after playing a teenager, Joyeux now plays a widow who gets enmeshed in a mistaken-identity caper in mid-19th century France, a convoluted tale involving Emperor Napoleon III, a lawyer, and nobody else that really matters much. While the camerawork remains smooth here, the editing is sometimes clunky, including a sequence when one character steals an object and is shown in multiple cuts leaving the room, walking away from the house, then entering yetanother room, a deft manipulation of scene transitions right out of the Tommy Wiseau school of filmmaking. Fortunately, the next film, “Douce” (1943), is the stand-out feature in the set. Another tale of dueling romances, “Douce” strikes a much more serious tone. Joyeux returns to playing an aristocratic teen, or something close to a teen, who uncovers a plot between her governess (Madeleine Robinson) and the family's estate manager (Roger Pigaut) and decides to stop it by seducing the manager, a long-time crush of hers. The wealthy household is ruled by Douce's fiery grandmother (Marguerite Moreno) while her sad-eyed father (Jean Debucourt), a widower, largely plays the helpless bystander as the drama boils over. Marred by a final twist so abrupt it comes off as absurd, “Douce” still packs a punch and features Joyeux's most compelling performance in the set. 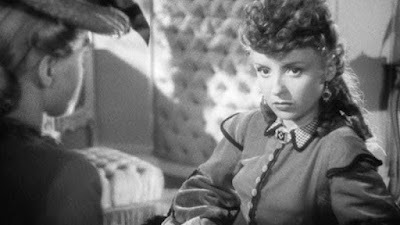 “Sylive et le Fantome” (1946) was released just after the war, and marries Autant-Lara's penchant for light romance with the ghost story genre as Joyeux, yet again playing a teen, falls for a long-dead man who played a role in her family's past. The story is pretty silly, but the film remains of interest because the ghost (or one of the ghosts) is played by the great Jacques Tati, in his first feature-film role. You honestly don't need to know more than that, so let's move on. All in all, the collection comprises a group of mildly entertaining movies, not particularly noteworthy, but also not the abominations some assumed they were after Truffaut's critique. Are they therefore worth your time? Consider one complicating factor before making your decision. Autant-Lara's public career ended in total disgrace. By the 1980s, he had embraced far-right politics and entered the European Parliament with Jean-Marie Le Pen's National Front, launching a series of anti-Semitic attacks, and spewing Holocaust denial propaganda. Many a think-piece has been written on how to approach the works of great artists who leave behind troubling legacies, but less thought is devoted to mediocre artists who do the same. I usually agree with the “separate the art from the artists” school of thought, but it also depends on how worthwhile the art is. I intend to keep listening to Richard Wagner for the rest of my life, but I feel I can safely live without any more Ted Nugent even if “Cat Scratch Fever” is pretty decent. All art should be preserved and preferably be made available to as wide an audience as is feasible. But while you might be curious about a sweet, sunny, mildly diverting romantic farce by a future Holocaust Denier, nobody will blame you if you decide you have other priorities in life. “Le Mariage de Chiffon” and “Lettres D'Amour” are presented in 1.37 aspect ratios, the other two films in 1.33:1. Like all Eclipse releases, all four films are offered with standard definition transfers, with little, if any, new restoration for the set. The image quality is still surprisingly strong considering that, though the quality varies with each film. “Lettres D'Amour” shows more intermittent damage from the source print than do the other films. All four films are black-and-white, and the B&W contrast is satisfyingly robust on all films. All four films are presented with Dolby 2.0 mono sound mixes, which qualify as efficient and functional, and nothing more. Optional English subtitles are provided to support the French audio. Each disc is stored in a separate slim keepcase with its own cover art, with all four cases tucked into the now-familiar Eclipse cardboard sleeve. As with most Eclipse releases, no extras are offered beyond the liner notes included with each disc, all of which are written by writer and translator Nicholas Elliott. It's great to have the Eclipse series back after a two-year hiatus, disappointing that the 45th installment may also be the least compelling of the series. April brings the next installment with Ingrid Bergman's Swedish years, so perhaps Eclipse will now return to a regular schedule, a welcome development for any film buff.